Did I miss something? After putting the gear, throttle, power capsule & the square piece into the machine it was to give me the portable fan coin. Do I need to do something else? I've also had this problem. Tried playing the game under a different player name, but same thing - no portable fan coin. Can't finish the game!!! annaroma wrote: Did I miss something? After putting the gear, throttle, power capsule & the square piece into the machine it was to give me the portable fan coin. Do I need to do something else? If things are NOT put into the machine in that order, then nothing will happen -- remember that from experience. I haven't gotten there yet. still trying to get game to allow me to use the screwdriver to open the glass for the owl statue. any clues as to why this is not working? thanks. i am frustrated. RCHEAT wrote: I haven't gotten there yet. still trying to get game to allow me to use the screwdriver to open the glass for the owl statue. any clues as to why this is not working? thanks. i am frustrated. 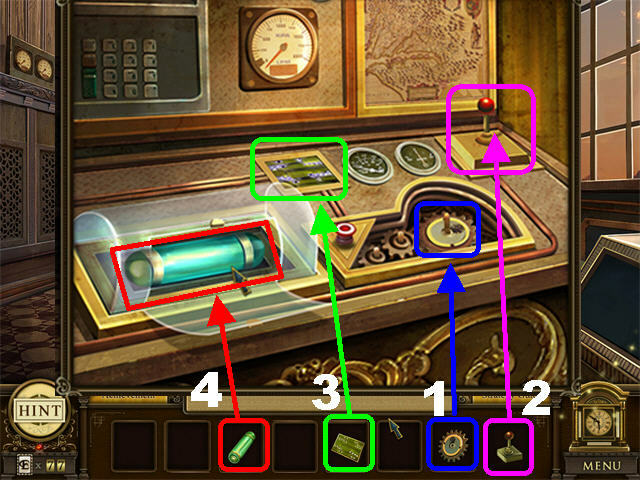 * Place the GEAR, JOYSTICK, CHIP, and ENERGY CELL into the machine, as in this screenshot. * Play the Arabian Palace, 1100 AD scene after completing the control panel. * Place the LARGE KETTLE HANDLE on the TALL BRONZE KETTLE. * Place the BLADE SHARPENER on the DULL CEREMONIAL SCIMITAR. * Place the CAT’S HAIRBRUSH on the UNKEMPT PERSIAN CAT. * Place the FLAVORED TOBACCO in the HOOKAH PIPE in the lower right. * Place the PILLOW TASSEL on the DEFICIENT PILLOW at the foot of the bed. * Put the BIRDCAGE KEY on the LOCKED BIRDCAGE on the right. * Place the CHAIN BREAKER on the CHAINED PARROT. * Place the CAULDRON PIECE on the BROKEN CERAMIC CAULDRON in the lower left. * You will receive the PORTABLE FAN CLOCK PIECE. * Open the Ageless Clock! * Place the BICYCLE, CAN OPENER, and MECHANICAL TOY PIECES in the left slot (A). * Place the LAPTOP, MEMORY CARD, and DIGITAL CLOCK PIECES in the right slot ( . * Place the FLASHLIGHT, PORTABLE FAN, and WALL CLOCK PIECES into the bottom slot (C). * Pick up the BLUEPRINT PIECE after you’ve solved the puzzle (D). I'd definitely recommend checking out the rest of the walkthrough if you run into any further trouble. It provides step-by-step guidance and some really helpful pictures as well! It can be found on the top of the Enlightenus II: The Timeless Tower Forum page, or by clicking here. To navigate through it quickly, use your computer’s search function (CTRL + F) and then type in “fan,” or another relevant word. put everything in exactly as it says and got a flashlight not a portable fan. stuck for the 3rd time in this game. Well crap!!! I have 2 digital clocks + the wall clock. I have NO flashlight. I'm soooo close to the end...really?? Am I going to have to start over???? I see most of these posts are from 2010...shouldn't the kinks be all fixed by now? So DO I have to start over? Look on the wall by the elevator...instructions are written there....also, check the WT.